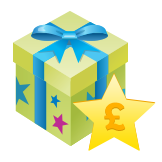 At partyworx.co.uk, we want to reward you for buying your customised gifts and party supplies with us by giving you something back! For each 50p you spend with us (not including delivery charges) we will credit your account with 1 Cash Point, you can then redeem the points against your next purchase with us. We’ll remind you at the checkout if you have any Cash Points waiting to be redeemed.